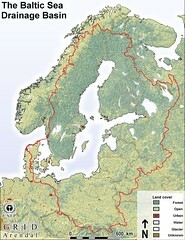 The Baltic Sea region is covered in primarily forested land and crop land, in the taiga and temperate forest regions. Agricultural land is a main driver for nutrient inputs to the Baltic Sea, and thus eutorphication, and is thus relevant. Forest lands acts as a net buffer for nutrients, unless it is heavily diked and/or fertilised.